Our most recent trip to the field was to retrieve two AWS stations that had been deployed for specific projects and were no longer needed in those locations - the instruments can be used elsewhere. These two stations, name "Marlene" and "Eric" were far south and required long flight times in the Twin Otter aircraft. Removing instruments from the Marlene tower. Out pilots (Mike, on the left and Henry, in the yellow jacket) are always willing to lend a hand and they have years of experience flying in Antarctica. Digging for the battery boxes at Marlene. The flight to Marlene is long and we needed to refuel the Twin Otter. For this journey we stopped at the Central Trans-Antarctic Mountains (CTAM) camp and fuel cache, where there are number of 55-gallon fuel barrels. CTAM is located at 84.0 degrees South. This is the furthest south I have been on Earth. The furthest north I have been is 85.0 degrees North, while on the icebreaker ship, Akademik Federov, last year. I have not yet been to either the North or South Pole. Quiz for the classroom: What is the furthest North and South each student has traveled (i.e. been on the ground or in a boat)? What is the latitude span achieved by the whole class? Lee moves heavy (200kg, 440lbs) fuel barrels from the cache at CTAM. 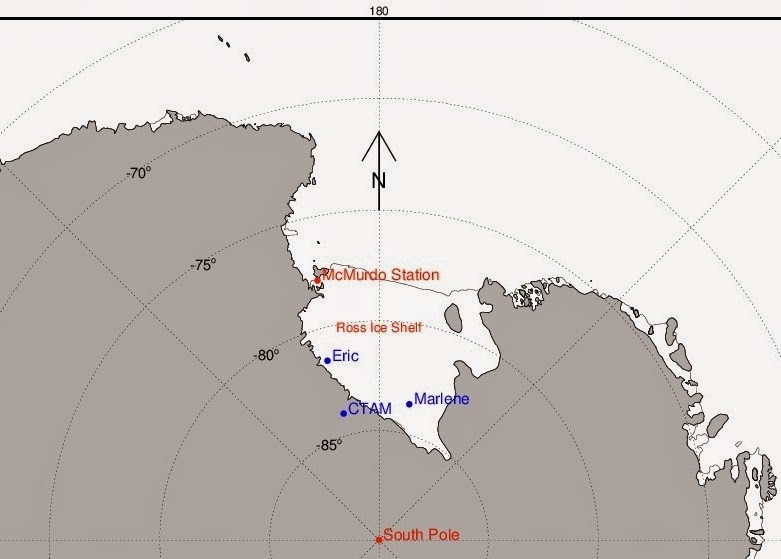 Both Marlene and Eric are located on the Ross Ice Shelf. An ice shelf is a large region of ice that is the result of glaciers and ice sheets spilling out into the ocean. Ice shelves float in the ocean and the ice can be hundreds of meters thick. As snow accumulates on glaciers and ice sheets that feed ice shelves they continue to move outward to the sea. This means that Marlene and Eric have been moving since they were installed. To balance the input of new ice at their source, portions at the ocean end of ice shelves can calve off and become icebergs. 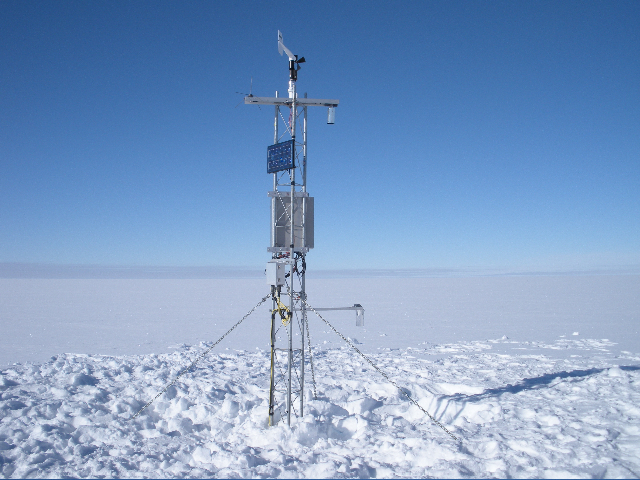 Only 40cm (16 inches) of the Eric station was above the snow, but our pilots found it. The solar panel was buried so the batteries had completely discharged, meaning that the station had stopped collecting or transmitting data. Eric station in January, 2010. Over 2.5m (100 inches) of snow had accumulated since this photo was taken.